Briggs’ Outer Barklouse found on mistletoe! The adult versions of those bug instars I’ve been finding on mistletoe berries have now been identified as, much to my surprise, Ectopsocus briggsi. Hooray! No, I’d never heard of it either. But what a cool name! (I may, possibly, be a little biased in my appreciation, but only for family reasons). 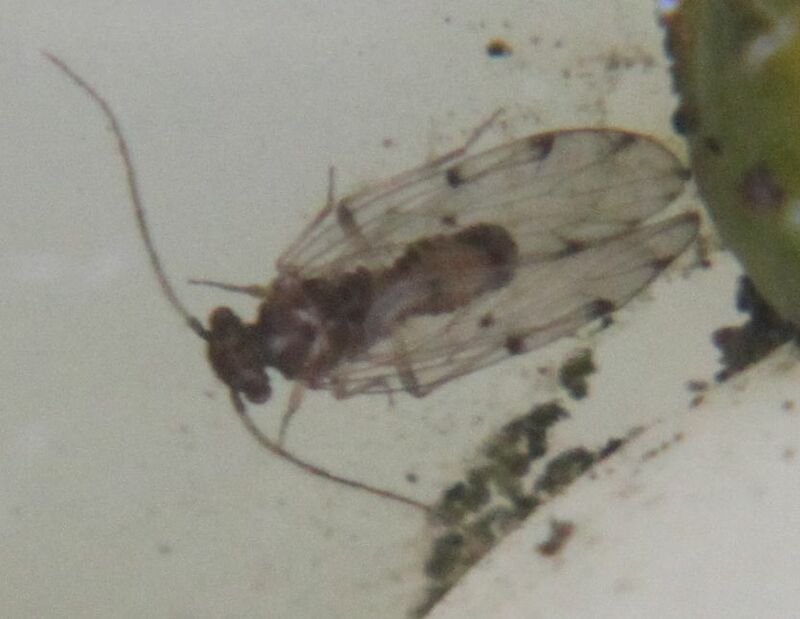 It’s a Barklouse, one of the Psocoptera or Psocids. And, in some accounts, it has been given the common name of Briggs’ Outer Barklouse. Outer what, you may ask? Outta mistletoe, in this case, is my answer. What’s it doing on mistletoe, and who is this Briggs bloke? Well, the Briggs bloke is, as far as I know, No Relation. He found the beastie as new to science in 1899, amongst leaf litter in Lynmouth, Devon. It’s since been seen all over the place – across the world, and on all sorts of vegetation. These Psocids graze on algae, spores etc and so, in the mistletoe berry clusters, are probably feeding on the thin layer of green algae that’s often present. So this is NOT a mistletoe insect in the strict sense – it’s not even feeding on the mistletoe, merely using the berry clusters as a habitat to feed’n’breed. Psocids are a bit of a speciality, even amongst insect hunters, so I’m grateful to my good friend and accomplished bug hunter John Hollier, of Geneva Natural History Museum and his colleague and international Psocid expert Charles Lienhard for a rapid determination from some photos.